Please register your interest now for the next course programme as places are limited to 12 participants, Click Here to contact us. Definitions and types of Acute Stress Disorder, Trauma, PTSD and C-PTSD. Assessment and formulation of differential diagnosis of Acute Stress Disorder, Trauma, PTSD and C-PTSD. Theory and application of psychotraumatology frameworks in the context of the neuroscience, dissociation and the psycho-pharmacology of Acute Stress Disorder, Trauma, PTSD and C-PTSD. An evidence based Equine Facilitated Psychotraumatology Model for Acute Stress Disorder, Trauma, PTSD and C-PTSD. Trauma focused resource facilitation skills for safety, stabilisation, regulation and containment of comorbidities: i) Mood disorders ii) Traumatic nightmares iii) Suicide ideation. Understanding equine psychology, behaviour, ethology and welfare. The theoretical considerations of the ethical standards for equines working with humans. Relational horsemanship skills: The tools, techniques and applications of working with horses as co-sentient partners for human development and change. Personal and professional development: Supervision, mentoring, assessment and mapping of facilitator’s own personal and professional development alongside accountability of the ethical considerations of clients. Critical self-reflexive mind-body based practice: developing self-awareness for both clients and facilitators. This is a part time programme and it is taught through a combination of on-site modules and distance learning elements, typically delivered over a year. The modules are delivered in blocks of three-five days onsite training with the IFEEL Q faculty. Written assignments, practical assignments, reflective journals, a reading list, horsemanship theoretical and practical assignments, client hours, a supervised workshop and a focus on practical skills work. You can see the full faculty profiles on this page. All IFEEL faculty are experienced and bring many different skills and knowledge to the courses. There is a high faculty to student ratio, typically at a 1:3 faculty member to student ratio, ensuring you get the 1:1 time you need. In addition to this, one of the faculty becomes your dedicated mentor, who you have 1:1 calls with during the course. You are also in a mentorship group with your mentor and other students for tutorials and group calls. You must have either completed the level 5 EFHD certificate before applying for this course or be a qualified therapist. For full details on how to apply for this certificate, please click here. You need to have completed 50 hours of supervised practice post graduation before attending the course. Our course attracts individuals from all a variety of different backgrounds and locations, our students travel from all over the world to attend, past students have come from Spain, Austria, South Africa, Lebanon, all over England, Wales and Scotland. The course format works well for those travelling from further afield due to the 3-5 days blocks with distance learning in-between. The minimum age to attend the IFEEL Q courses is 21, and we have had students whose ages range from anywhere between 23 to 72. Vegetarian lunches are provided on the course and are organic and biodynamic where possible. All food is vegetarian and other dietary requirements are catered for. All refreshments are included, with a range of teas, coffee, biscuits and fruit available. Our Training prices are currently being reviewed and will increase for 2020. 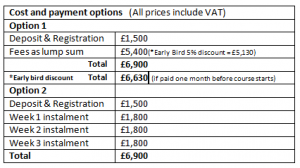 To take advantage of the advertised 2019 prices below please book your place for the 2020 Crossfields Institute Level 6 Diploma in the IFEEL Method of EFPT by the 1st October 2019. This course has proved to be highly popular and only a few places remain for 2020. This qualification is self-regulated and awarded by Crossfields Institute. This course is quality assured by Crossfields Institute’s Quality Assurance Team and has an External Examiner with Crossfields who is an independent person who manages the quality of the programme and visits us to monitor the quality of assessments, ensuring qualifications are delivered in line with regulatory requirements. In addition to our Internal Quality Assurer who is responsible for ensuring that consistent and reliable assessment decisions are made by the assessors and for monitoring the quality of the assessment process for all learners. This ensures that you can be confident in the quality of the programme.